I can admit, now, that I thought the whole project doomed. An online-only magazine for cutting-edge game writing, published by a Harvard lawyer with a passion for tabletop games, edited by a novice, funded by a company that ran support forums - I gave it six months. Now, for its fifth anniversary issue, The Escapist has invited me to perform karmic penance. "The New York Times of gaming"
The Escapist was originally described in March 2005 in an 11-page proposal produced for internal use by the Themis Group. Named for the mythic Greek Titan who embodied custom, community and divine law, Themis ran the WarCry Network and various MMOG support services. The proposal omitted a business case for a media website, though Themis chairman Tom Kurz says, "Launching a webzine was actually a logical extension of our capabilities." 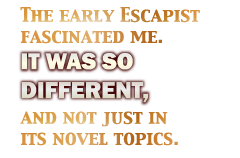 In contrast to consumer game magazines, with their reviews and buying guides, The Escapist would feature "New Games Journalism," inspired by Kieron Gillen's 2004 call for articles that emphasize the gamer over the game - "travel journalism to Imaginary Places." The Escapist, read the pitch, "always aims to make an emotional connection with a game through excellent storytelling. The Escapist will be sharp, edgy, entertaining and informative. Above all, it will aim to be trusted - it will be the New York Times of gaming in that respect. Its word should be holy writ." Name-checking The New Republic, Wired and Salon, the project targeted "an intelligent audience of digitally-savvy developers, insiders and influencers interested in the new-new thing." This thing became officially new-new when The Escapist issue 1, with the theme "Gaming Uber Alles," debuted on July 12, 2005. Contributors included Gillen and Penny Arcade's Jerry (Tycho) Holkins. Early issues, with similarly illustrious writers, included "Grand Theft Adaptation," "Girl Power," Asia, niche gaming and "Fast Forward 2020." The early Escapist fascinated me. It was so different, and not just in its novel topics. In lieu of forums, it had weekly Letters to the Editor. Almost unprecedented in my experience, The Escapist had a fact checker, Nova Barlow, who also writes industry analysis white papers for Themis. (I'm guessing the fact-check for this article will be easier than most.) Early ads pushed, not games or video cards, but Carlsberg beer and Ford - what Kurz calls "non-endemic" advertisers. Kurz pursued them to validate the value of the site's demographics. "Non-endemics that spend with us are effectively telling the world they value the intelligence and influence of our audience." The Escapist's most striking and provocative innovation was its magazine format, designed by Creative Director Jon Hayter and Associate Publisher Greg Lincoln and programmed by Lead Developer Jason Smith. "On the first day of The Escapist, at 10:00 am, we flipped the switch and made our first issue live," says Smith. "I sent our first weekly newsletter to 64 people. I don't think that we got much more work done that day, the entire company was nervously excited and passing links around, looking at the comments that other people were posting about us."